Space: Will Tonight's Full Moon Be A Blue Moon? Will Tonight's Full Moon Be A Blue Moon? CAPE CANAVERAL, Florida -- There will be a Full Moon tonight on Tuesday, August 20, 2013 at 9:45 p.m. Eastern Daylight Time. The Moon will be 98.7% full on that day. The moonrise over the Atlantic Ocean on Central Florida's east coast will occur around 7:30 p.m. Eastern Daylight Time (with a few minutes deviation depending on your exact location.) The moon will set around 8:30 a.m. on the morning of August 21, 2013. For those planning a stroll along the beach to watch the Full Moon, the Full Moon brings along with it a 4.5 foot high tide that will occur around 8 p.m. Eastern Daylight Time, with a few minutes of variation depending on your exact location. Will the August 20, 2013 Full Moon be a Blue Moon? The most commonly accepted definition of a Blue Moon is the second full moon in a calendar month. Full moons are separated by 29 days, while most months are 30 or 31 days long - so it is possible to fit two full moons in a single month. NASA says this happens every two and a half years, on average. The phrase "Once in a Blue Moon" is commonly known to mean something rare and offbeat because of the rare occurrence of a Blue Moon. The August 20, 2013 Full Moon is not the second full moon in August. 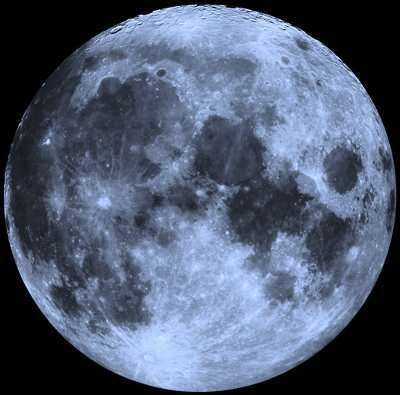 However, some articles have stretched the definition of a Blue Moon to mean the third full moon when a single season has four full moons - but that definition is not widely accepted. Are Blue Moons really blue? The date of a full moon, all by itself, doesn't affect the full moon's color. The full moon on August 20, 2013 will be pearly-gray, as usual. People did see blue moons almost every night when the Krakatoa volcano exploded in 1883 with the force of a 100-megaton nuclear bomb. Plumes of ash rose to the very top of Earth's atmosphere. Some of the ash-clouds were filled with particles about 1 micron wide - the right size to strongly scatter red light, while allowing other colors to pass. White moonbeams shining through the clouds emerged blue, and sometimes green. NASA says the key to a blue moon is having in the air lots of particles slightly wider than the wavelength of red light (0.7 micron)--and no other sizes present. This is rare, but volcanoes sometimes spit out such clouds, as do forest fires. In the western U.S., there will be several wildfires still burning on August 20, 2013. If any of those fires produce ash or oily-smoke containing lots of 1-micron particles, the Blue Moon there could be blue. More likely, the Moon will be red. Ash and dust clouds thrown into the atmosphere by fires and storms usually contain a mixture of particles with a wide range of sizes. Most are smaller than 1 micron, and they tend to scatter blue light. This kind of cloud makes the Moon turn red. NASA says that red Blue Moons are far more common than blue Blue Moons.